Since Valentine’s is just behind us and you might have some chocolate lying about, I thought I’d focus my first post upon this unique pairing: chocolate & cheese. In fact, just a few years ago, Trader Joe’s was selling a delicious english cheddar with ribbons of chocolate mixed in, but as much as I loved it, it ended up in their product graveyard, as so many of their specialty items that I adore do. 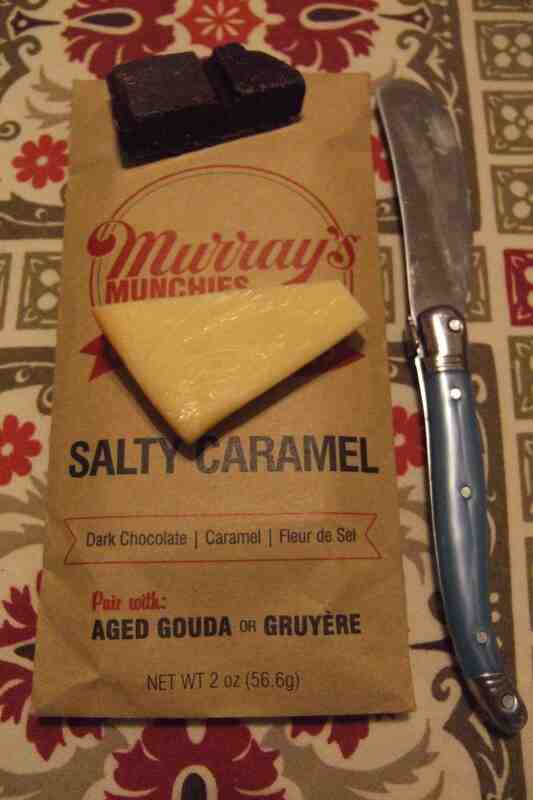 Thankfully, Murray’s, a local cheese shop in NYC, has put together some yummy new combos of my two favorite snacks. 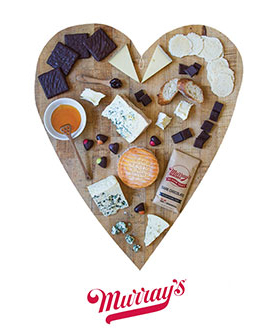 Their new munchies line includes bars of chocolate meant to be shared alongside particular cheeses. The first set I tried was a salty caramel square with the recommended gouda. My gouda was smoked, not aged, but it still paired quite well. Lately, I have taken to buying large hunks of this smoked gouda, grating it all, and mixing it with mayo and pimientos for that special Southern spread: “mentacheese”*. The smokiness in the gouda lends a bacon-like quality to the sandwich. My thanks to Grapes & Beans in Clayton, Georgia for turning me on to this twist on an old favorite. 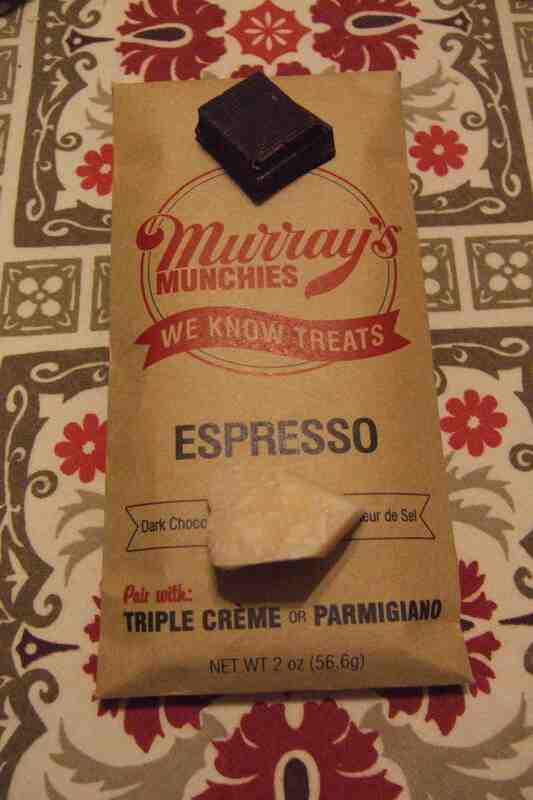 The next pairing was a coffee-infused chocolate with that “king” of cheeses: Parmigiano Reggiano! Though I have Italian roots, I was raised far from the boot or its D.O.P. formaggi, so my childhood experience with this cheese was via its snaggle-toothed sixth cousin, a mild powdery nastiness shaken out of a green can. And if you’ve ever wondered why that stuff tastes more like cardboard than cheese, it’s because it’s got wood pulp (cellulose) in it! Anyway, years later, I was shocked to watch an Italian mamma slice large chunks off a real Parmigiano half wheel and hand them over to her rather picky four year old son, who would greedily devour them. By this point, I had happily made the conversion from parmesan to Parmigiano, but to treat the cheese as I do cheddar, slicing, or rather chipping off chunks and eating it whole?… well, folks, these days, I’m just like li’l Marco. Anytime I cut off some Parmigiano for the grater, oops, a few extra shards just have to been eaten whole. As you can see, my cheese and chocolate appetizer was followed by a plate of pasta, liberally sprinkled with the good stuff. And now, perhaps it’s time for a bit more chocolate to round out the flavor of this royal cheese? While fancified versions of pimiento cheese do exist and you are certainly welcome to try them out, at its roots, this Southern spread is an easy pantry concoction. 1. Grate a hunk of sharp cheddar cheese (or smoked gouda, or any hard cheese with robust flavor). 2. Simultaneously, mix in enough mayonnaise to make it sticky (I like mine on the less-is-more mayo side but my Uncle John’s version is swimming in the white stuff) and at the same time, open a small jar of pimientos (I go for the diced over the sliced), drain the juices, and then mix them into your cheesy-mayonnaise (or mayonnaisey-cheese) mixture. Once the spread is ready, put it on whatever bread, crackers, chips or whatever you have on hand that can serve as transport to your mouth. I am personally a big fan of toasting some bread and then smearing it with “mentacheese”. It’s also a great add-on to a burger, in place of that traditional wimpy slice of American (not)cheese. Waffle and Brown Cheese Friday! It wouldn’t be right to spend a week with brown cheese and not eat it on a waffle. It’s a favorite Norwegian snack to have alongside afternoon tea or coffee. 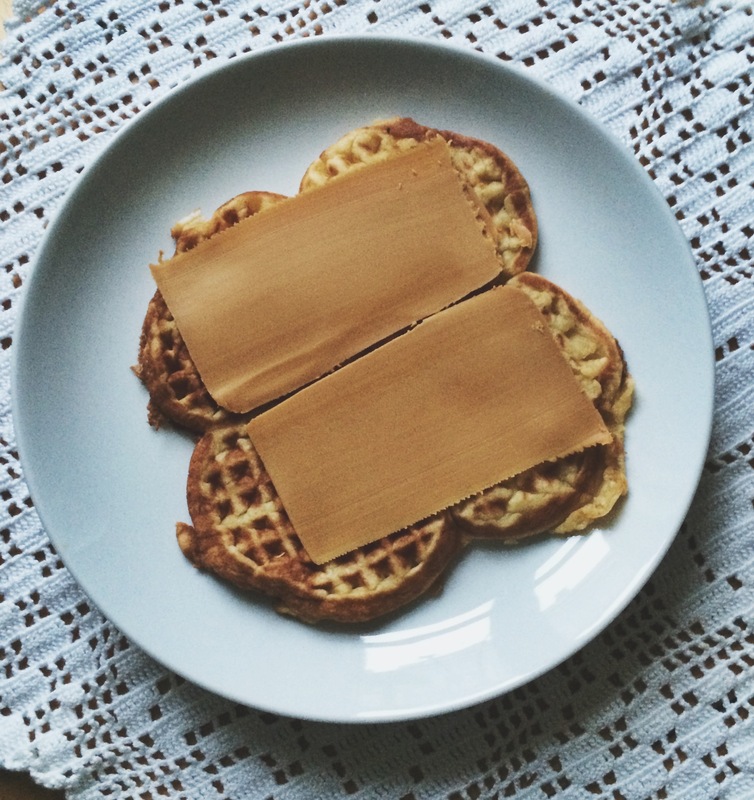 I’d go so far as to say that Norwegians love waffles with brown cheese as much as they love hot dogs, but that’s a different story for a different blog. This waffle recipe comes from my mother-in-law, and she added a little touch from her sister-in-law, so it’s got strong Norwegian bones. My husband makes it every Friday for work and I always get a few leftovers at the end of the day. I don’t want to know a week without a Waffle Friday. Beat the eggs and sugar until creamy then stir in melted butter, milk, and sour cream. Slowly mix in flour until batter begins to thicken. Gently mix in club soda or sparkling water. Let the batter set for 15-30 minutes before cooking in a waffle maker. *Just a little note for any readers who are used to firm, thick Belgian-style waffles…this recipe makes very soft waffles. They are more like a pancake with a waffle imprint. But that makes them so much easier to fold over (and therefore portable). A cheese that sounds suspicious…but is delicious! This week our cheese-y adventures take us up to Norway: home to glorious mountains, trolls, trendy sweaters and….brown cheese! What’s that you say? Brown cheese?? I was suspicious when I first heard about it too. It was offered to me on a slice of bread one chilly December morning on my first visit to Norway in 2007. I hesitantly took my first bite, then very eagerly took my second, third and final bites. Silky smooth, slightly sweet and satisfyingly sticky, I couldn’t get enough of this odd sounding cheese. 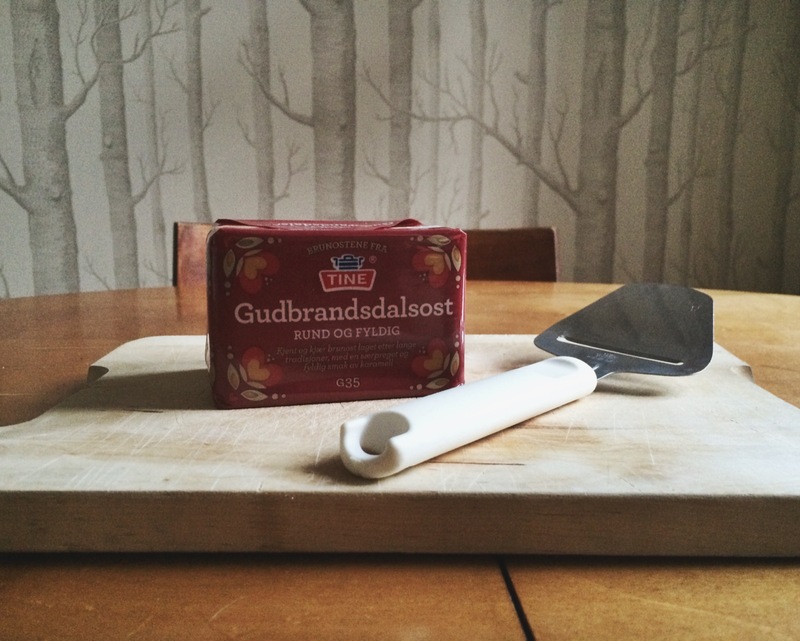 The Norwegians call it brunost (brown cheese), and for most families, it’s a breakfast staple. 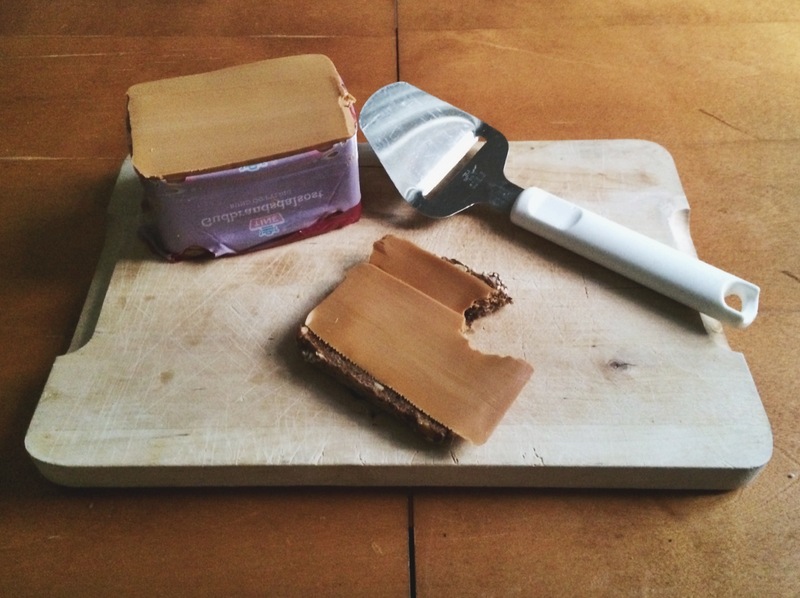 So, why is brunost brown? It’s made by boiling a mixture of milk (both cow’s and goat’s milk can be used), cream and whey for several hours until the water evaporates. The heat turns the milk sugar into caramel, which is why it’s brown (and delicious!) There are 12 varieties of brunost, ranging from lower fat recipes to special Christmas flavors. My favorite way to eat brown cheese is on buttered bread. I usually add a dollop or two of apricot or cloudberry jam to top off the deliciousness. 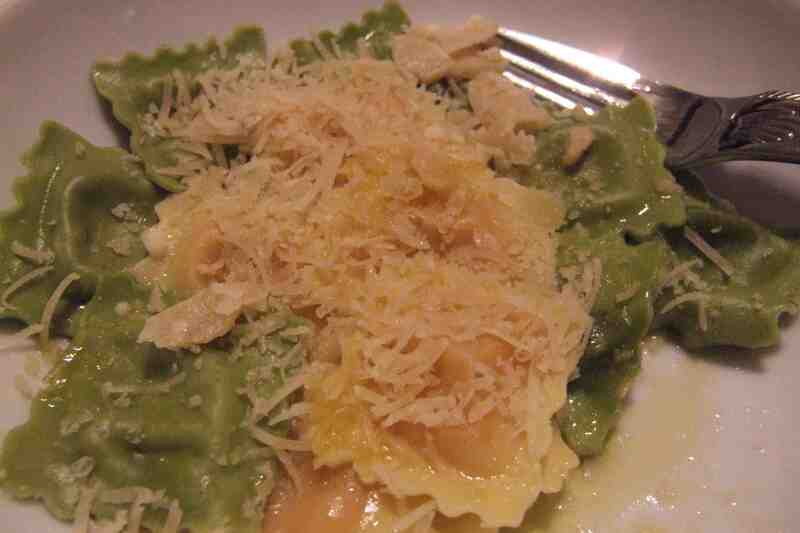 But, I’m always looking for new ways to incorporate brown cheese into a recipe or meal. I once topped a baked potato with a few slices and when I proudly told my viking-boyfriend (now husband) what I had done, he let me know that was completely unacceptable and it was never spoken of again. So for now, I’ll just stick to bread and butter. Or maybe this ice cream. Later this week, it’s Waffle Friday. We’ll be eating brown cheese on waffles and sharing our secret waffle recipe with you – stay tuned! What cheese do you use to hide a horse? …. MASCARPONE! Welcome to the inaugural and slightly unorthodox cheese of the week. 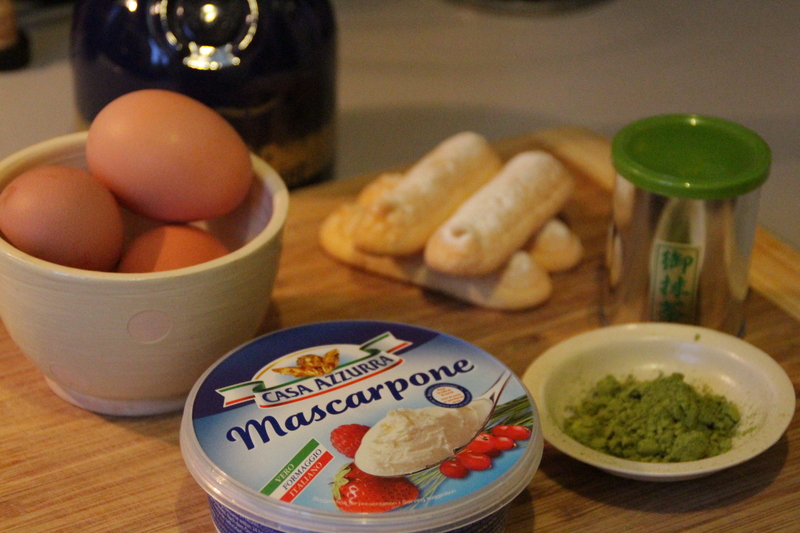 A thick, creamy, spreadable cheese that originated in the Lombardia region of northern Italy in the late 16th or early 17th century, the name ‘mascarpone’ may come from the Spanish mas que bueno (better than good), or from mascarpia, the name for ricotta in the local dialect, because both ricotta and mascarpone are made by very similar processes. Mascarpone is made by curdling pasteurised cow’s milk cream with a small amount of citric or acetic acid then draining residual liquid through a finely woven cloth. It does not contain any rennet and is therefore completely vegetarian. This cheese is best known as the essential ingredient in Italy’s signature dessert – Tiramisu – which means, literally, ‘pull me down’ – a name that might be attributable to mascarpone’s deliciously high fat content of 60-75%. It can also be used in savoury dishes, adding creaminess while not detracting from flavour. Available in potentially every supermarket’s dairy section in the entire world, this incredibly un-cheesy cheese is apparently ridiculously easy to make at home … next time! So how did I devour my cheese of the week? Here we come to the unorthodox part of this high-pressure first blog post … (drumroll please) … I made Machamisu! 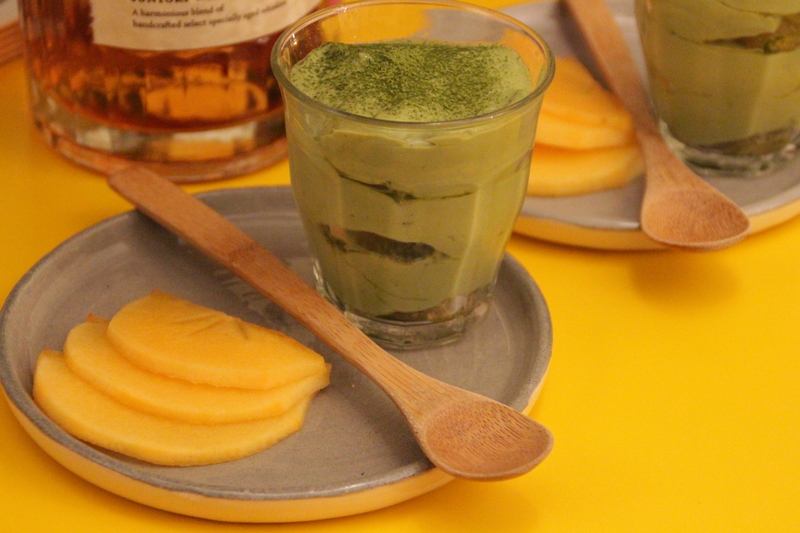 A Japanese variant of what the BBC so appallingly describes as Italy’s ‘coffee trifle’, using macha (green tea powder) instead of coffee, along with copious amounts of hidden horses. 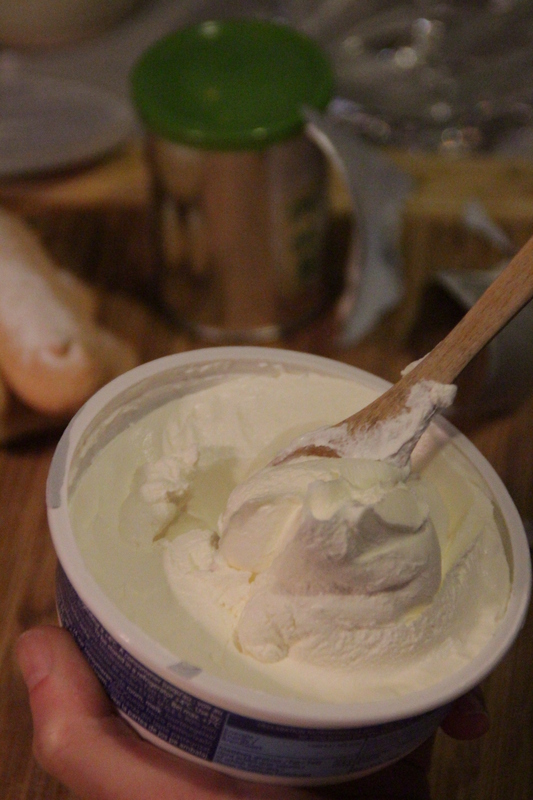 How do you like your mascarpone??? Dissolve 1 tablespoon of macha in a small glass of hot water. Allow to cool and add a splash of grand marnier. Don’t taste this concoction, it’s not very nice – but it WILL be. Leave aside. Trim the ladyfinger biscuits to fit the size of the dish in which you would like to serve you machamisu – I chose individual duralex glasses. Dunk the lady fingers in the glass of macha and grand marnier for a few seconds, then place at the bottom of the dish (layer 1). 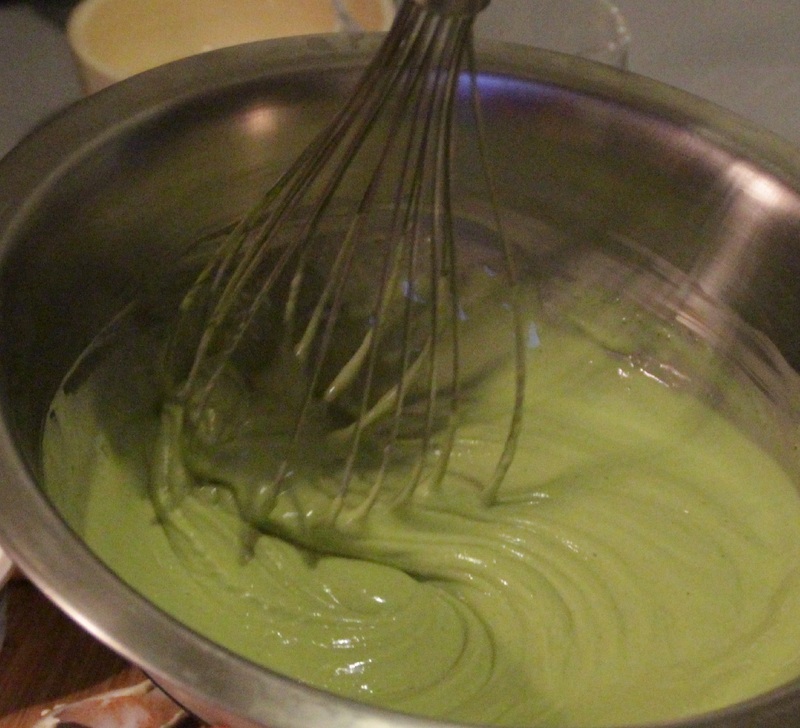 Cover with the macha and mascarpone cream. Repeat layer 1 two more times, finishing with the mascarpone cream. Cover and refrigerate until you are ready to serve. Before serving sprinkle the top with sifted macha. Serve with slices of kaki (persimmon) and a fine Japanese whisky (I chose a 17 year old Hibiki). Enjoy!